or what a difference some trim makes. 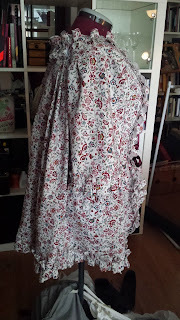 After I had finished the main part of the pet en l'air I started to think about how to close it and trim it. 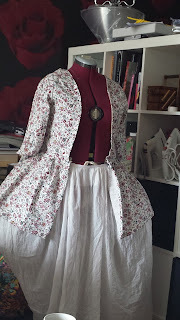 I'm still hoping to loose some weight, so I wanted to make a closure that can easily be adjusted. So I decided to use ribbon bows, with a stomacher under it. 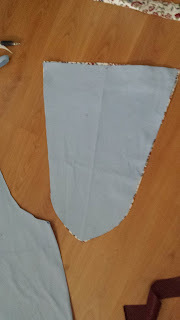 For the stomacher I simply statrted with pinning a piece of scrap fabric in the gap and cutting it into a nice shape. I realized that such a Sharp point would be tricky to look nice, so I made it more rounded. 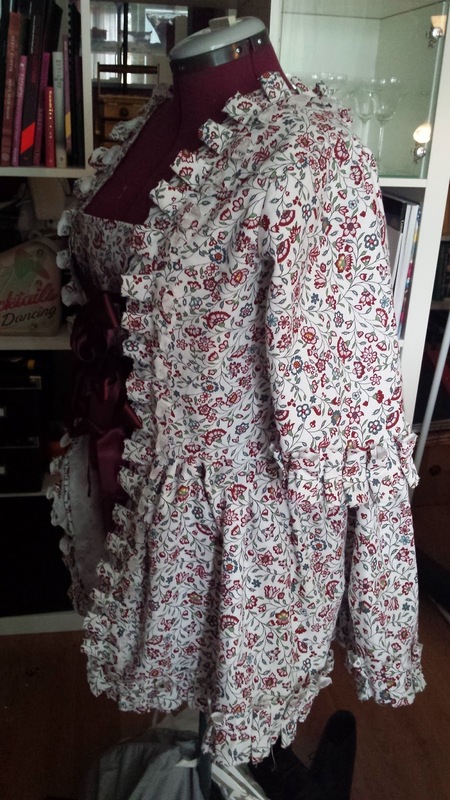 I cut the stomacher in two layers of fabric. The underlayer is a sturdy old tablecloth in some kind of linen blend, and then the outer fabric is the same as the main jacket. I folded the edges toward each other and sewed them together. 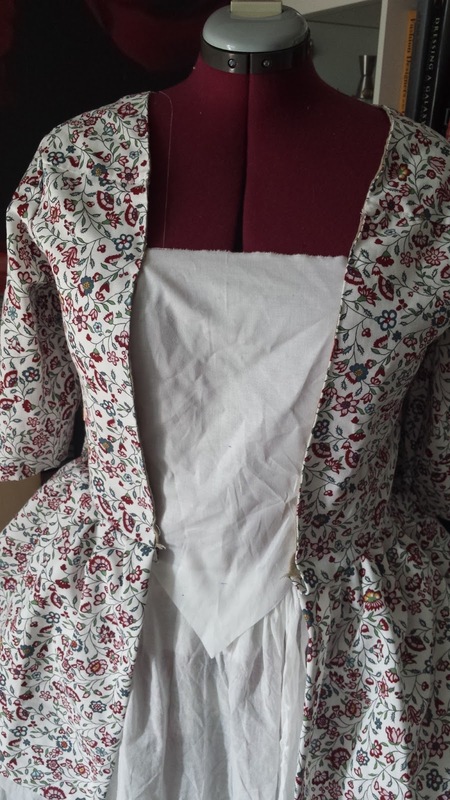 The stomacher has no boning and is made to be pinned to the jacket. Then I took what remained of the fabric and cut it into strips. I pleated it directly onto the pet en l'air while it was on the dressform. I had to be quite generous with the spacing between the pleats, because there wasn't quite as much fabric as I wanted left. 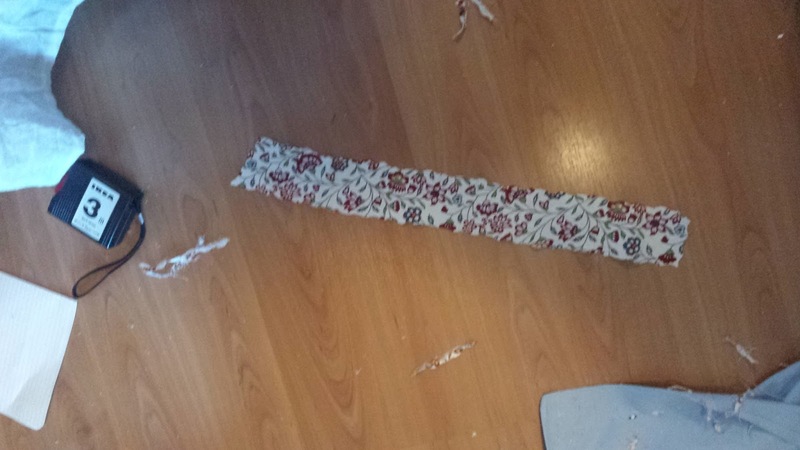 In fact this is all that remained of the fabric that I had bought. 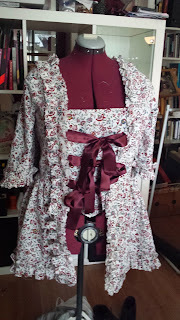 I also sewed three pairs of ribbon on under the trim. There are no robings on the pet, but the trim acts as robings to hide where I've attached the ribbons and will pin the stomacher. 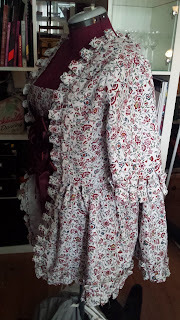 One reason why I didn't do robings is because the fabric is so thick. 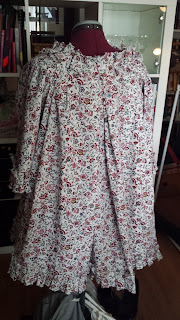 It's close to an upholstery fabric, and I felt that it was better to go for trim than robings. And then the pet en l'air was finally finished. I love how the trim turned the pet en l'air into quite and frothy little cupcake. It was well worth the work of putting it on.